Posted April 8th, 2013 by Tyler Smith. 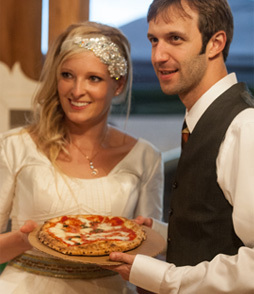 Pizzeria MOTO weddings are truly something that guests will remember. In an age where the “chicken, beef or fish” menu’s have fallen by the wayside, we step in and cook our food in our mobile wood fired oven, on site, in front of guests. Our oven is the perfect backdrop to spark conversations, and to let guests know you want them to have a great time at your event. Our food is casual and approachable, and quality is our #1 goal. We offer a full range of artisan pizzas, wood fired appetizers, and drinks as well. We’ve catered company parties as small as 50 people for organizations like The Swiss Embassy and Cisco Systems; and catered larger events for crowds of 800 people for companies such as National Geographic, The Marriot Hotel Group, and Booz Allen Hamilton. Our typical lunch or happy hour menu can be as simple as our delicious wood fired pizza and salad to expanding the spread to include appetizers too. Call us to find out how we can be a part of your company event and reward your employees with something worth talking about. 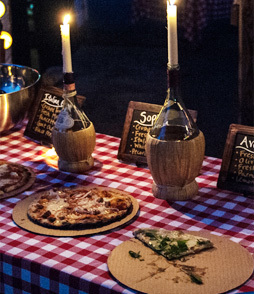 For times when normal food just won’t cut it, Pizzeria MOTO is there to help you create an unforgettable menu for those special events in your life. A 1 year old’s first birthday party, a 25th year wedding anniversary, a celebration of life party. 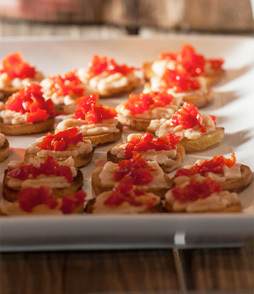 We can handle all of the dinner, appetizer and non-alcoholic drinks so you can enjoy yourself. Let us do all of the work and handle the stress so you don’t have to.